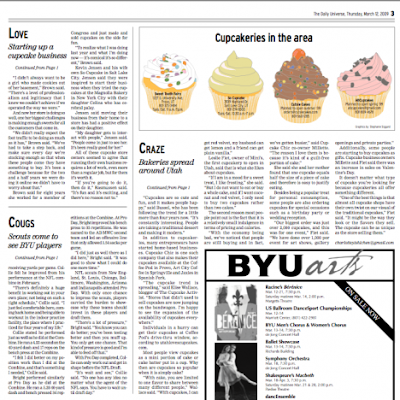 Check out this article published in the BYU Daily Universe. 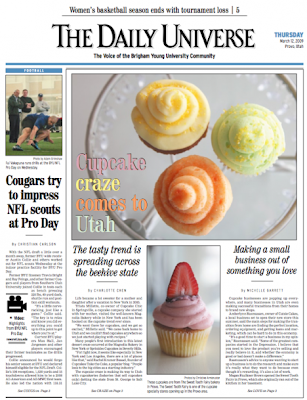 "Cupcake Craze Comes to Utah" talks about how cupcakeries are sprouting in the state of Utah. Charlotte Chen, the author of this article, interviewed me last week and a few of my quotes are featured in this article. I have reviewed a few cupcakeries in Utah, so I have some knowledge about the cupcake culture in Utah. (See my reviews for Twenty Five Main and Diva's Cupcakes.) I'm happy to see that cupcakes are gaining success in Utah. Recently, a new cupcakery opened in Provo, Utah called Sweet Tooth Fairy. They have been featured on many cupcakes blogs and even the Rachel Rey show. Next time I visit Utah, I will definitely be stopping by to check out this store. WOW! thanks for the great news! :) Its always nice to see more cupcake shops.. and really any news of cupcakes coming to UTAH! come up and visit me so we can go! i've heard the sweet tooth fairy is great. i might even make the drive next time in utah to check them out too!